Fiberglass boats last forever — or so it seems. Early one recent morning, J.J. Johnston was working on a 25-foot outboard-powered Sea Vee center console from the early 1980s. “This boat, literally, has 10,000 hours on it,” says Johnston, owner of J. Johnston Marine in Old Saybrook, Conn., a repair and restoration shop specializing in outboard boats from 16 to 30 feet. A lot of rough water during a lot of years and either not enough or simply tired stringers and supports allowed the bottom to flex, causing cracks a quarter century later in the hull sides. Johnston and Steve Bertolini were busy measuring and cutting 3/4-inch plywood pieces that eventually would be coated in epoxy and glassed athwartships into the stringer system from just abaft the console to the transom to strengthen the hull. 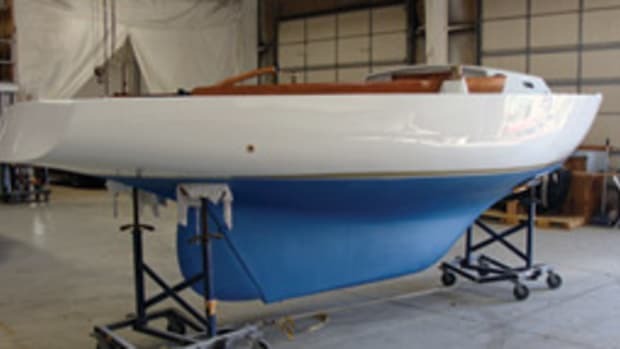 Restoring, upgrading and redoing fiberglass boats is an ongoing trend, attracting not only professionals like Johnston but do-it-yourselfers fueled by a dream and, in this tough economy, the desire to save a few bucks. Vintage sail- and powerboats from the 1960s, ’70s and ’80s can be found in all parts of the country, at prices ranging from next to nothing to considerable sums, depending on condition and pedigree. We recently heard of a “classic” that was dug out of a lawn, where it had been turned into a planter, and sent back to the original builder for a restoration — true story. All it takes is some imagination and some talent. Wet transom -- The transom of this 22-footer in Johnston&apos;s shop was soaked and needed to be replaced, which is often the case with older fiberglass boats. Taking advantage of the latest in materials and methods, rehab specialists and enterprising DIYers are able to fix almost anything on older fiberglass boats, from patching holes and redoing decks and transoms to repowering, rewiring and redecorating. With four decades worth of fiberglass boats available, there’s certainly no shortage of models to choose from, especially in these difficult economic times. For others, it’s the desire to fix up the boat they remember from their youth, or one they just can’t seem to part with. Tom Bent’s restoration of a 1975 Egg Harbor 30 was inspired by a version of the boat he’d been on years before. 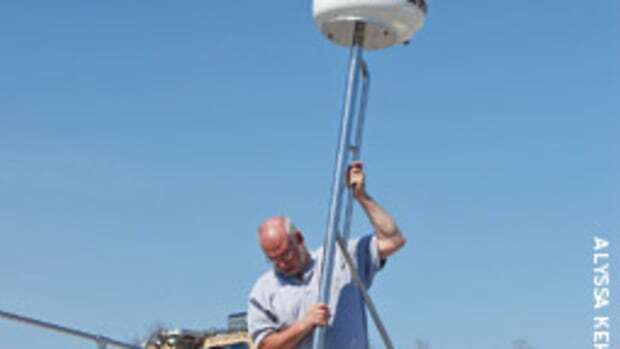 When he spotted another model in a Connecticut River boatyard, it seemed like destiny. Sometimes the old boat being brought back is a true classic. Mark Clayton, the operations manager at Pendleton Yachts in Isleboro, Maine, remembers well the restoration of Seal, a 1959 Block Island 40 sloop thought to be the first production fiberglass centerboard sailboat in the country. Bertram 31 -- Slane Marine in High Point, N.C., specializes in Hatteras restorations, but when an owner brought them this neglected 31 Bertram, the yard rebuilt the boat from the hull up. Tom Slane, president of Slane Marine in High Point, N.C., specializes in Hatteras restorations, which is no surprise considering that Tom is the son of Hatteras founder Willis Slane. “A lot of people will take an older boat that they like and freshen it up,” says Slane, who currently has a pair of 36s in the shop and two larger boats waiting in the wings. Slane spoke of the “enhancements” he made to a 36-foot Hatteras that was pushing 40 years old: full flybridge, new diesel power, 400-gallon fuel supply, fishboxes, icemakers and more. 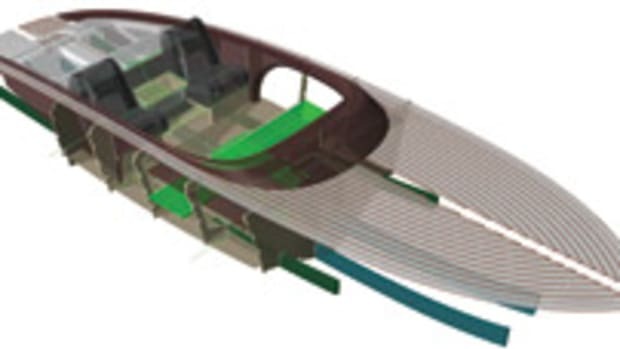 Properly planned and executed, restoring older fiberglass boats makes sense, although project boat work comes with a host of caveats, including caveat emptor (buyer beware). “If the boat has value, if the hull is a good one, and you have the opportunity to buy it at the right price, it can be a viable way to go,” says Hunter Scott, who restored boats for about 35 years until he closed his Pocasset, Mass., shop about a year ago. “And the technology is there to repair almost anything. 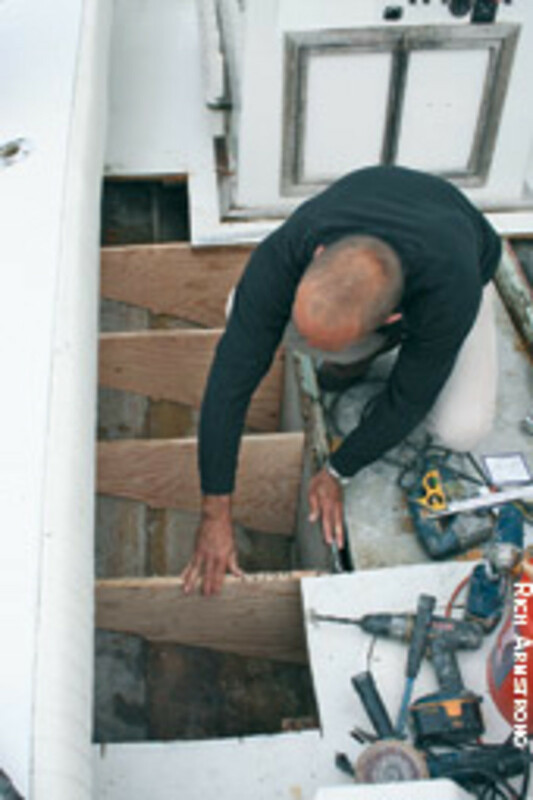 Decks can be rebuilt, flybridges redone or added or removed, even a hull that’s been damaged can be repaired. A fiberglass restoration project can make a lot of sense. 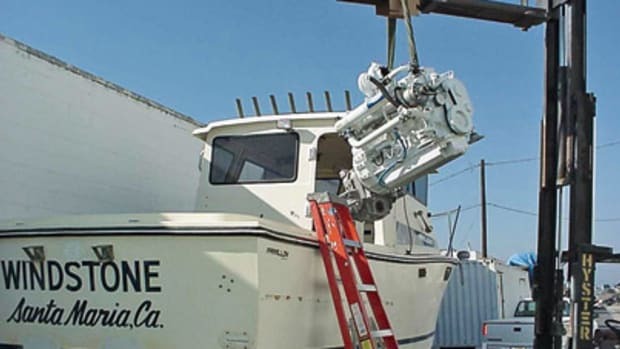 Johnston specializes in restoring outboard classics like Makos, Sea Crafts, Sea Vees, Boston Whalers and the like. 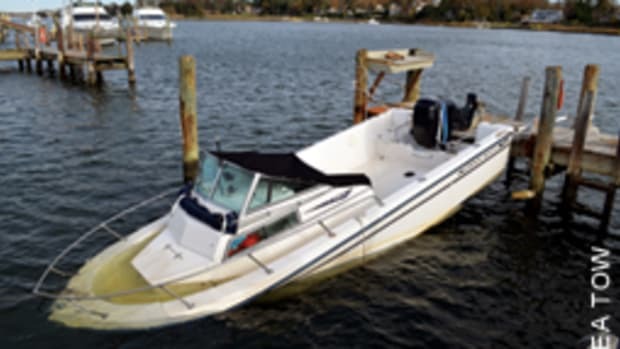 What are the typical problems he finds with older outboard boats? “Decks and transoms are the two biggest things to go,” says Johnston. In addition to full restorations, his three-man shop does a lot of what he calls “a la carte” work in the 6,500-square-foot building or outside in the large yard. “Fuel tanks, consoles, changing layouts, transoms — we can change things and customize the boat to make it just the way the customer wants,” he says. The rebuilds Johnston does usually run from $10,000 to $25,000, not including repowering. 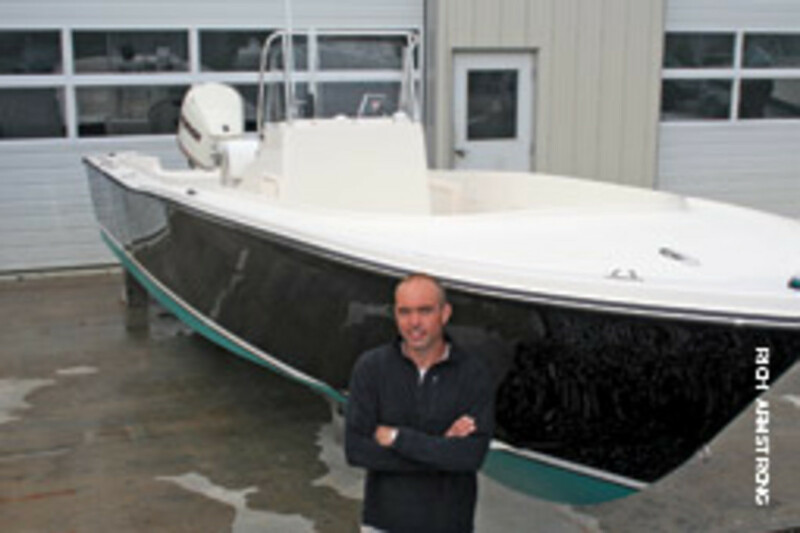 The 1978 25-foot Mako he just finished for himself (and which he intends to sell in a year) is one nice piece of work. There’s more to a successful project than just make and model. Anyone who’s looking for a fiberglass boat to restore has to start with a vision — and a strong one — of the finished boat, Scott says. Of course, it’s important that you find the right vessel for what you want to do with it when it’s done. The late Paul Bennett used to say, “It’s horses for courses.” In other words, you don’t want a big, husky cruiser if you’re going to be weekending and doing day trips, and you don’t want a weekender for a family cruiser. 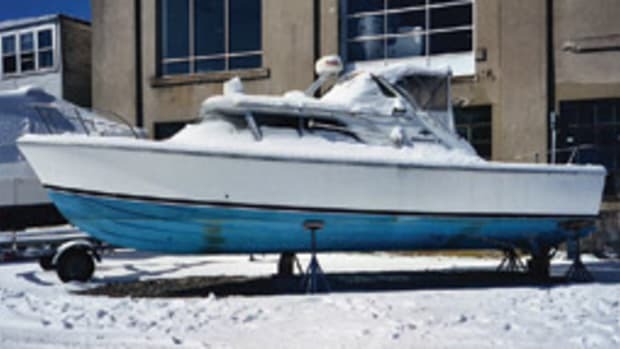 The journey to bringing a boat back to so-called “desired condition” begins before you buy with either a thorough, professional survey or a cold, hard, educated layman’s assessment of the boat’s condition. Go over the boat by yourself. Sit in it for a while and look around. 1968 Boston Whaler Nauset -- Soundings editor Bill Sisson and technical writer Frank Kehr completely stripped the old Whaler that Sisson now uses for fishing and family outings. 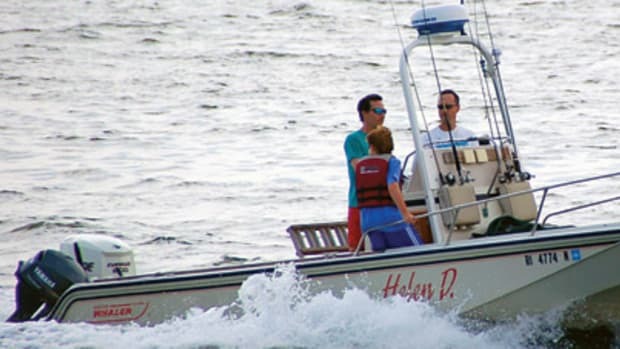 Soundings technical writer Frank Kehr has been involved in a number of full and partial rebuilds and restorations, from a 13-foot Boston Whaler to a 50-foot convertible. He says he sees all too many project boats foundering in boatyards and back yards because of a lack of organization, planning and resources. Bringing all this information together, Kehr says, gives you a clear picture of what lies ahead and allows you to coordinate your work and budget with any professional assistance that may be required. Some common themes emerge from surveyors’ reports and restorers’ inspections as to what owners might see on their “to-do” lists. Repowering: This is usually the biggest single expense in any major rebuild project. “It’s always a hot topic,” says Slane. “You’re exchanging old technology for new. That big 500-hp diesel can be replaced with a much lighter one that will do the same thing. And taking a couple of tons of engine weight out of the boat can make a dramatic difference in boat performance.” If practical, rebuilding an old engine certainly is a less-pricey alternative. Rewiring: More often than not, the old stuff has to come out, which has the potential of being costly, depending on the size and sophistication of the boat and how much you can do yourself. Structural repairs: They can be expensive and difficult for DIYers, depending on what’s amiss. Sometimes you don’t know exactly what you’re dealing with until you’ve got the decks off or opened up, and you’re right down in the structural guts of the vessel. “We took the tanks out of a 26-foot center console and found that the stringers had parted from the hull,” Scott recalls. “So the project went from replacing tanks to installing a whole new stringer system.” Lesson: Be ready for surprises. The work can be divided in several ways. Some projects are handled completely by a restorer or a boatyard, with the owner perhaps offering ideas from the sidelines. A few are total do-it-yourself jobs. Many are a combination of the two. In the latter case, expect the boatyard to play at least a basic role — hauling the boat, pulling a rig, lifting an engine, repairing a keel. Depending on the project, you may need to rely on them for mechanical work, woodworking, electronics installation or hull refinishing. Marine subcontractors — boatwrights, canvas workers, accessory makers, metal shops, and so on — are valuable assets for the DIYer, too. They decided they could handle the glass repairs; redoing the mechanical, electronic and plumbing systems; and such cosmetic jobs as sealing ports, rebedding hardware, painting and varnishing. The yard would paint the hull, commission and launch the boat, and provide assistance along the way. Watts’ auxiliary engine provides a good example of how the two roles meshed. “The yard determined the engine was worth saving but was in need of a thorough cleaning, inside and out,” says Watts. “So I had them take it out and put it on my trailer. I brought it home and broke it down, cleaned and rebuilt it myself — a winter project.” Other offseason “home work” included refurbishing the stove, rebuilding the head and varnishing whatever they could take off the boat. The more a yard, restorer or contractor is going to be involved, the more important it is to choose the right one. Find out as much as you can about the business. How long has it been around? Does it retain its workers? Are they experienced? What other restoration work has it done? Remember, you’re depending on the yard’s standards to help make your job a success. How much the owners can do themselves depends on their time, talents and interest. In most cases, a DIYer can save thousands of dollars — sometimes tens of thousands — in outside labor costs by making fiberglass repairs, stripping and varnishing woodwork, redecorating the interior, even rebuilding an engine. But it’s not something to go into starry-eyed. The experts advise networking. Tap into the boatyard’s or repair business’s collective brain trust. Put together a personal support group to turn to for advice and help. Does your circle of friends include a mechanic or an electrician or someone simply willing to help scrape a bottom or sand varnish for a cold drink and a free meal? When it’s done, what you’ll end up with is a boat of your own, Clayton says. It may take six months, or it may take two years, but the work and the wait are often worth it. In the case of the Block Island 40 restored by Pendleton Yachts, the boat was solid, the vision strong. It took a full winter to repower; redo the electronic, mechanical and water systems; refinish the interior; and upgrade deck hardware and rigging. “The idea from the beginning was to make it safe and reliable for long-term family cruising while retaining her original character,” says Clayton, who managed the project. Every system on the boat was renewed, with nearly all the work done by the yard. The owner who restored Seal (she’s now sailing under a new skipper) also put his own ideas into the boat, having the boom shortened to reduce weather helm, enlarging the icebox, even adding a few fiddles down below. The rejuvenated 50-year-old fiberglass Seal now cruises the coast of Maine — proof that when it comes to old fiberglass boats, the right materials in the right hands do amount to something of a fountain of youth. But if you do, well, there’s nothing like a boat project. This article originally appeared in the July 2009 issue.